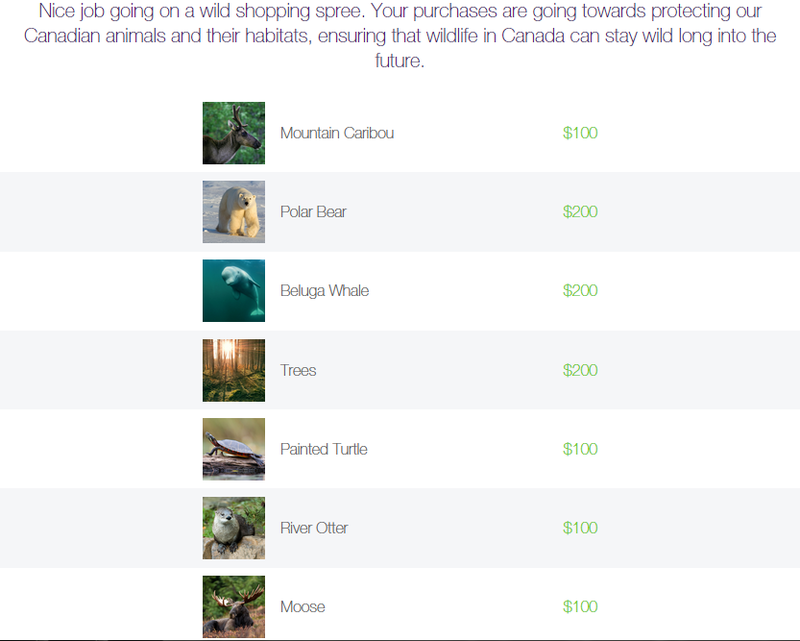 Shopping spree to help #protect #wildlife @TELUS #shopwildly is the best retail therapy I've had in years! Everyone needs a little retail therapy now and then ... including our wildlife! Tis the season for giving and I was given the opportunity to #ShopWildly and help TELUS decide how to spend $5 Million dollars to protect wildlife and the environment. Doing Good Deeds for Wild Things sure feels good! to programs, causes and initiatives to protect wildlife and our environment. I like to spread the funds around. A little here and a little there. All those littles add up to a big difference. You can make a difference too! Simply by shopping at a TELUS store you can help to protect animals and environments that desperately need it. For every TELUS store purchase you will receive a code for up to $10 that you can redeem at the TELUS Shop Wildly site, where you decide which animal to support with those funds. Even if you don't make a purchase you can participate by visiting the TELUS Shop Wildly site. You simple click on SHOP NOW and you will receive a code to spend on the intuitive of your choice. Once you're done shopping be sure to share using the hashtag #ShopWildly and let all your friends know so they too have the opportunity to do Good Deeds for Wild Things. Join the #ShopWildly conversation with @TELUS on twitter and TELUS on facebook! This is the best retail therapy I've had in years! Yep, just me Cathy thinking out loud about wildlife! Note: I was not compensated this post, but I did have the privilege of spending a $1000 Shop Wildly code to support and help protect the wildlife of my choice. You can see how I spent that $1000 Shop Wildly credit in the image above. Christmas Eve is the best time to snuggle up with family and loved ones and watch a holiday show! Here are a couple of my favourites for the family to watch together and a few for the adults to watch after the kids have gone to sleep. Very Very Merry Christmas and Happy Holidays! Yep, just me Cathy thinking out loud about my favourite Holiday Movies. Note: I was not compensated for this post, but I do receive Netflix and a streaming device in order to do my posts/reviews as part of the Netflix Stream Team. All opinions are my own. 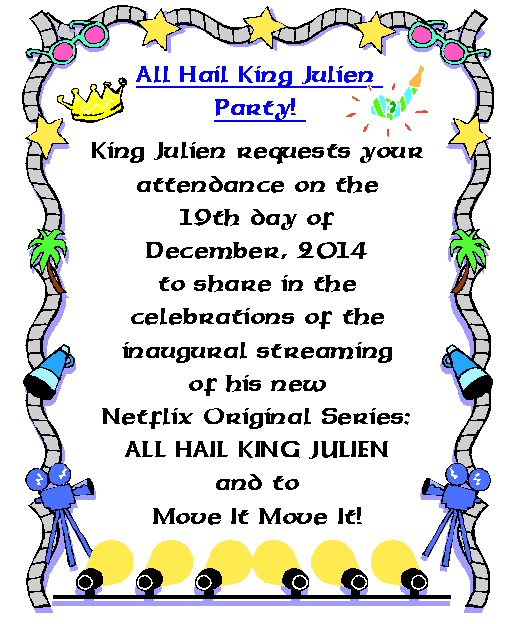 #AllHailKingJulien @Netflix_CA Original Series Streams 5 NEW Episodes Dec 19th #Streamteam Cause for Celebration! But since we are friends and all, and I know you'll keep it on the down low, I'll share some of the details. But keep it quiet cause the celebration doesn't start till December 19th! Did you just sneak a peak of the sneak peak? I love the characters from the Madagascar movies and King Julien is no exception. So it's pretty exciting that King Julien of Madagascar and his kooky sidekicks Maurice and Mort are back to their old tricks in a new way! 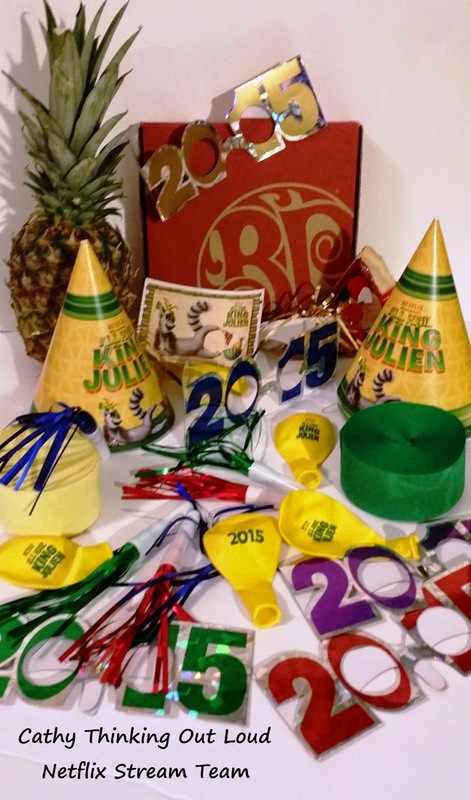 On December 19th, 2014 a new Netflix Original Series, All Hail King Julien debuts 5 new episodes! Now that is a reason to celebrate! 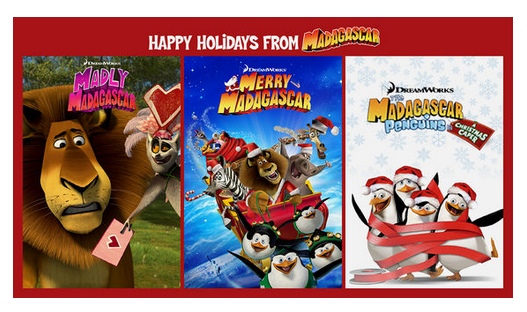 luckily you can enjoy Happy Holidays From Madagascar. Share your best video or picture of your "Move It" dance, who your favourite character is, or who you are inviting to your All Hail King Julien party with me on twitter @CantonCathy using the hashtag #AllHailKingJulien. I would love to hear all about it! Check out KingJulien.com, or All Hail King Julien on Facebook for more King Julien fun! Yep, just me Cathy thinking out loud about Netflix Stream Team and King Julien. Note: As part of the Netflix Stream Team I receive Netflix and a streaming device free of charge for the purpose of my Stream Team reviews and posts. All opinions are my own. Tis the season to get into #HolidayMode & connect with loved ones! Here are #CTOL & @TELUS Mode Switch (off) Tips! We all love our tech, and even Moms like me are big fans of their smartphone for convenience, to stay connected, shopping and social media. I might even be a bit addicted to 2048...what?! But as the holiday hustle and bustle, parties and visits begin it's easy to forget to slow down, unplug and focus on connecting with family and friends in a meaningful way. This is a time to create memories not just tweet about them. NO TECH AT THE TABLE -PERIOD! (not by way of social media, but face to face). Conversations are open for all to join in, and share. If you need a one on one conversation the dinner table is not the place. My kids actually quote me "it social time so I can share my opinion" or "you shouldn't have brought it up at the table if you didn't want us all to talk about it." I admit my kids need a reminder from time to time about this rule, especially if you are dining out or visiting where the conversation is adult focused. I personally believe the art of conversation and listening are skills best perfected through practice while free of technology. But for those who can't completely unplug here are a few ideas to at least use your tech to bring family and friends together. Skype with relatives and friends that live out of town. Better yet get a group Skype party going, or have all the grand kids Skype the grandparents together. Play your favourite Holiday Playlist for everyone while gifts are being opened. This is my Sounds of the Holidays Playlist, I hope you like it! Look up holiday recipes and How To tutorials about cooking and baking to WOW your family and friends with your culinary skills. Look up How To tutorials to make DIY gifts and decorations, or cool ways to wrap gifts to make them really special. Search for cool holiday activities and ideas. Search and make a list of the times and channels all your favourite holiday movies are playing. Or check out Huffington Post's list of Best Christmas Movies and TV Show Episodes on Netflix Canada. Then put the tech away while you and your family watch them together! Are you wondering if you need to unplug more and get into #HolidayMode? Be sure to share your #HolidayMode plans, ideas, experiences, photos, and your successes or fails (we know you will do better next time) on twitter with me @CantonCathy and @TELUS using the hashtag #HolidayMode. I would love to read all your stories and shares! Yep, just me Cathy thinking out loud about getting into Holiday Mode. Note: I have not been compensated for this post. I love the idea of finding ways to better connect with friends and family over the holidays, and thought this TELUS campaign was worth sharing with my readers. Master of more than just toys! @MastermindToys #Barrhaven have mastered the art of customer service as well! These days I'm not often WOWed by customer service, and I believe we often see the true colours of a brand or store when they deal with an issue or problem. How a brand or store resolves issues speaks volumes about them. In life things happen, and not everything runs smoothly all the time. I understand that, and in general I am accepting of an honest mistake. It is unlikely I would stop shopping somewhere because of a single mistake if it is resolved quickly, professionally, and keeping in mind my time is valuable. It's important to me that there is at least an acknowledgement and stated understanding that part of "making it right" may very well involve compensating me for my time and frustration. This acknowledgement should come from the brand or store not because it has been pointed out to them but because it is the right thing to do. Speaking from a strictly business perspective it is cheaper to keep me as a customer than to win me back. So the smart way to keep me as a loyal customer is to resolve issues in a way that makes me want to be a loyal customer because I can count on that service not only as I open my wallet, but afterwards as well. I have shopped at Mastermind Toys for years. I have always loved the variety and quality of the toys I found there. I grew up in the Great Toronto Area (GTA), but have lived in Ottawa for years. Most of my family still lives in the GTA so I often shopped at Mastermind Toys when visiting family. They carry all the kid's favourites like Lego. Recently Mastermind Toys has opened several stores in the Ottawa area! This was exciting news for me, and BONUS I happen to win a gift card as part of the Barrhaven Store Grand Opening Celebration. When I went into the store to pick up the gift card, I had the pleasure to briefly chat with the Store Manager, Ruth. I go to use my gift card, and for whatever reason it is not working. I call the store and Ruth is in and she resolves the issue quickly and professionally leaving me feeling very good about the whole experience. She understood and acknowledged the error, apologized and took care of it. It did not involve me driving to the store, or giving me a number to call and wait on hold to resolve a issue that was not of my doing. There was no jumping through hoops to get it resolved, just good old fashioned customer service. Ruth respected and valued my time, and me as a customer, and made one little boy very happy. I am quite happy to have gotten an opportunity to chat and get to know Ruth better. I felt she really was making every effort to make this as easy, quick and painless as possible. I am always happy to share with others about great service, and support local businesses, but rarely do I end up taking the time to give a shout to the people that make a business special. That is something I hope to change starting with a big shout out to Ruth! Thank you for all your help! So if you haven't been to Mastermind Toys in Barrhaven (Ottawa) you should definitely make a point to visit, and while you are there say hi to Ruth and tell her Cathy sent you! Yep, just me Cathy thinking out loud about excellent customer service. Note: I was not compensated in any way for this post. It is merely a thank you to Ruth and her excellent service. It is much appreciated. If you know me, you know I'm a coffee drinker. I have the occasional tea but could live without it if I had to. Coffee not so much. I want one GOOD cup of coffee in the morning. That's how I start everyday. 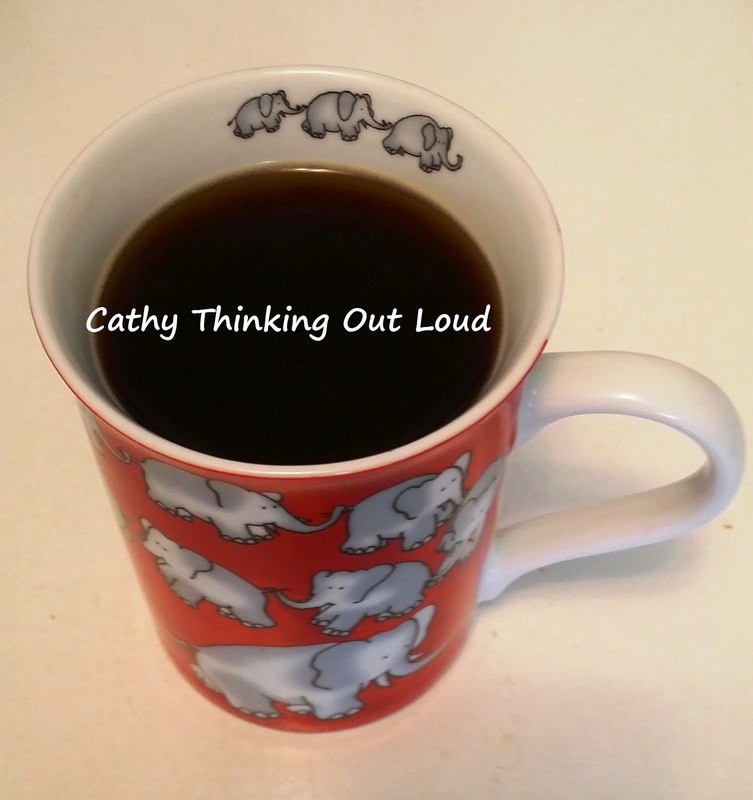 Cathy Thinking Out Loud with Coffee! After 22 years of marriage my hubby still makes me coffee every weekday morning and leaves it on the bedside table. It's the little things that make life really great. This is why we loved our single cup Keurig so much. My husband gets up an hour before me and with the Keurig each of us gets a freshly made hot cup of coffee. But on the weekends we use the big coffee maker to make a pot of coffee. My son even indulges from time to time when there is a pot already made. We have a single serve Keurig for weekdays, and a coffee maker that makes a full carafe for weekends. Each take up valuable counter real estate in our small kitchen. So I'm pretty excited to get the chance to say goodbye to those and hello to the Keurig 2.0. With the hot water on demand feature I can say goodbye to my kettle too! 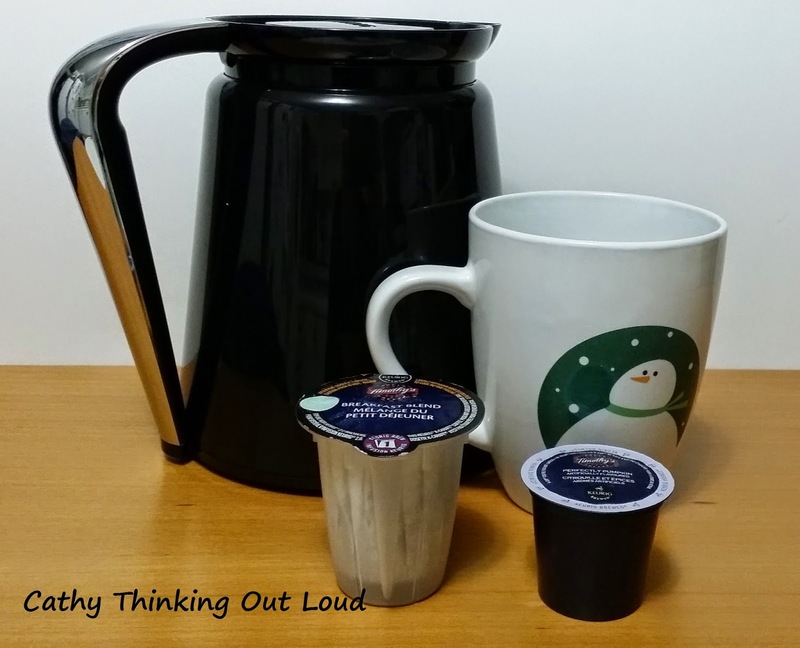 All the convenience of a Keurig with the ability to make a carafe or cup with one coffee maker! 1.) Cup or Carafe option! With the touch screen step by step instructions it really is a breeze to use. Brewer maintenance alerts are great; reminding you when to top up water in the water reservoir, etc. A 70 oz. illuminated easy to fill water reservoir. Cup size options up to 10 oz cups. Hot water on demand; perfect for tea, hot chocolate or Lemon cold & flu beverage if you are feeling under the weather. 3.) 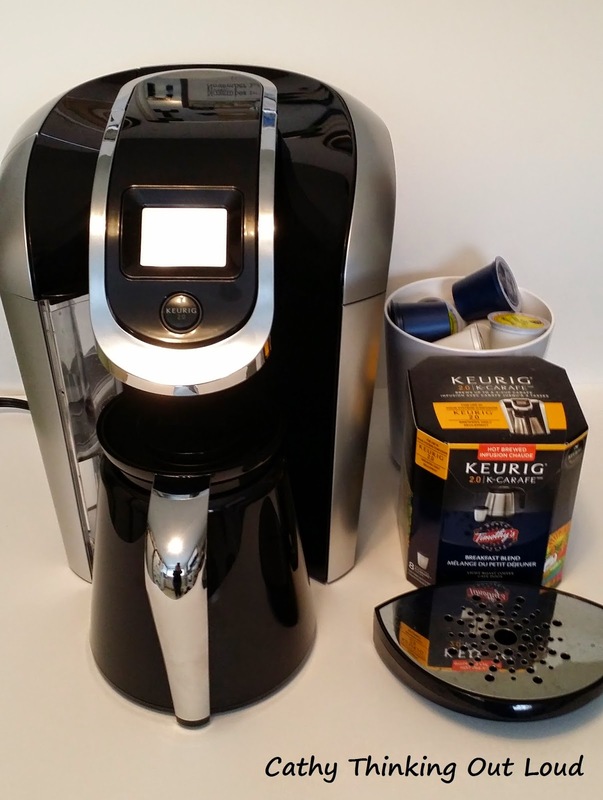 The Keurig 2.0 is quieter than my Single Cup Keurig or Coffee maker! 4.) Plus there are lots of brands and flavours to enjoy! 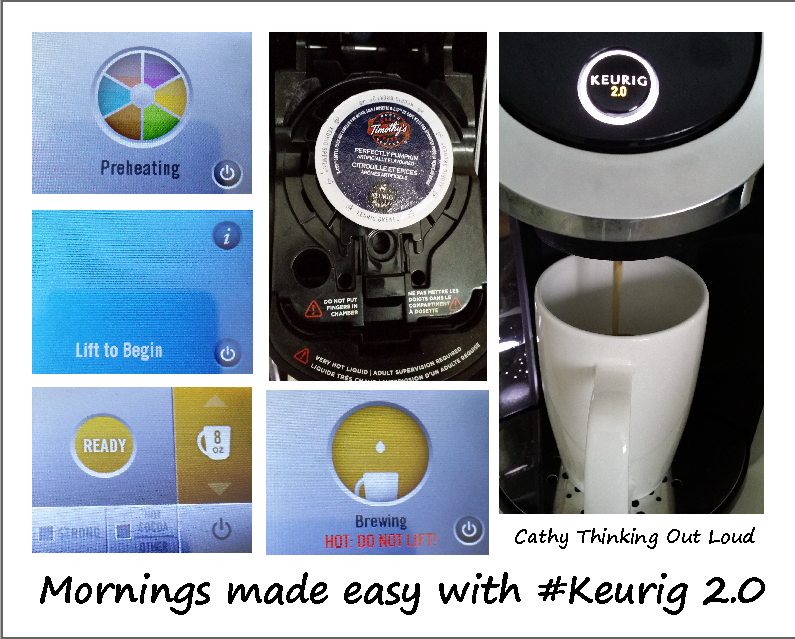 I truly love the functionality of the Keurig 2.0 and the cup or carafe option, and highly recommend it! A final thought: I have been a Keurig fan for many years. I see the debate over whether Keurig should have the right to control and limit their brewing devices to Keurig only products and feel pretty strongly that like other brands such as Tassimo and Nesspresso they absolutely should. They are a business in business and are under no obligation to make their brewers compatible with other competing coffee suppliers. Having said that one of the reasons I bought my first Keurig was because they had a reusable filter. I wish Keurig would take the environmentally friendly lead on producing fully recyclable cups for their brewers. It is the one issue I have with the Keurig 2.0. Where the carafe cups are recyclable the single cups are not. 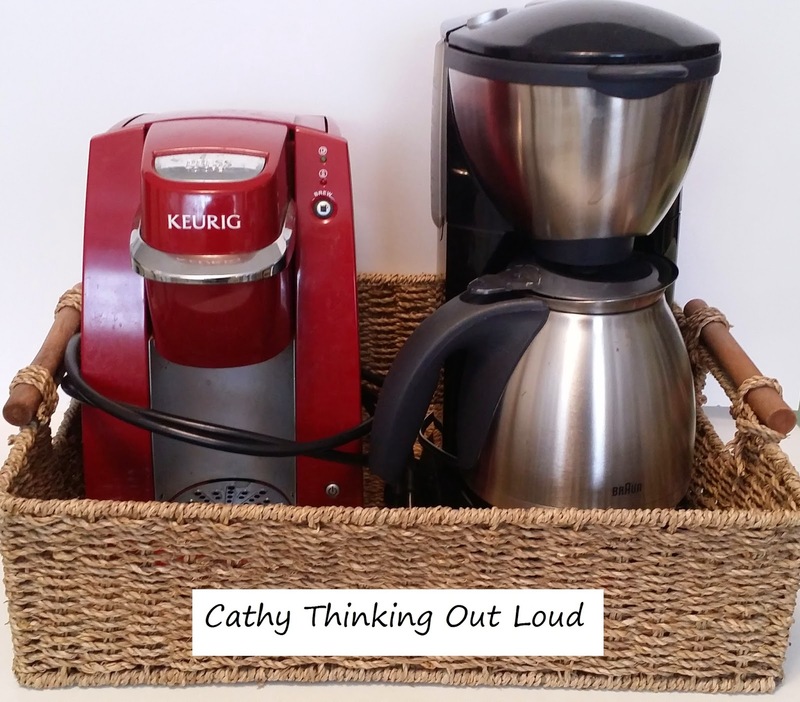 Yep, just me Cathy thinking out loud about coffee. Note: I received a Keurig 2.0 for the purpose of this review. All opinions are my own and reflect my personal experience with the brand and product. New Year, New Approach to New Years Resolutions. As you try to fit into a dress that doesn't fit and figure what to wear to the New Years Eve Party, you're probably thinking about how fast 2014 went by and about 2015. Maybe you're thinking how it will be different, or how you will be different; and exercise, lose a few pounds, get more sleep, de-clutter and organize your work, house, life. I know I do this every year and have varying degrees of regret and guilt that I haven't achieved more in the past 12 months. 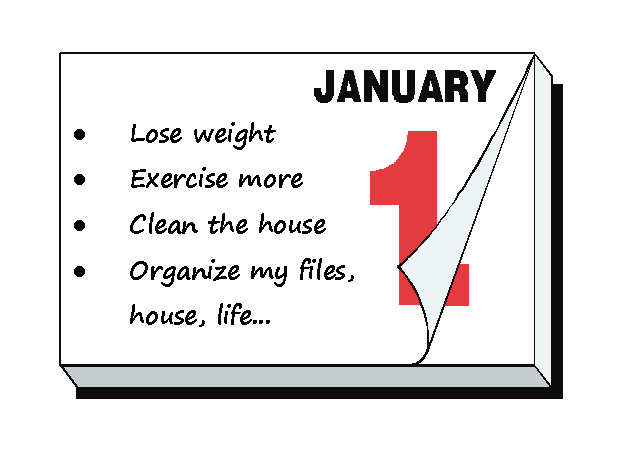 I vow this year will be better and I will exercise, lose weight, clean the house, cook from scratch, get more sleep. Same old resolutions every year. So this year I'm thinking of taking a different approach; instead of the same old resolutions I'm going to try something new. I'm going to commit to using my voice for good, and try to communicate in a meaningful way at least once a day. It might to write a letter or card to someone I know would appreciate it. Or a share on social media for someone who can use a helping hand. It might be sharing a picture of something beautiful I see just because it's beautiful and will make someone smile. Maybe it's to lend a stranger with car trouble my phone to call for help. Maybe by switching my motivation for why I am doing something I will see a change in the end result. I certainly don't know if this will work, but I do know what I have been doing in the past isn't working. I'm going to combine "communication" activities with my goals to exercise, lose weight, organize etc. I could walk to mail the letter, or take a picture. I could organize and de-clutter items to donate to a cause I'm sharing about on social media. I could do something nice for someone else, which makes me feel good and motivated to keep going and get off my behind and achieve some of my resolutions. This whole thing started when a friend offered to sponsor this giveaway. We are twitter friends and although I have never met him in person, I consider him to be a truly great friend. He made this offer to support my blog. Who does stuff like that?! Well if he can do this, why not me. This gesture motivated me to do something similar and give to someone else, and guess what? Since my cell phone is one of the major ways in which I communicate, a giveaway for a phone seems like a perfect way to start the new year. So my question to you is: If you win this HTC Desire 320 phone how are you going to use it and your voice for good in 2015? Giveaway is for a Telus Prepaid HTC Desire 320. The giveaway is open to Canada and runs from December 9th - January 1st, 2015. Good Luck! Yep, just me Cathy thinking out loud about 2015. Note: I have not be compensated monetarily for this post. However the enormous compensation in terms of support from the friend who sponsored this giveaway is priceless. It is through his generosity I am able to provide my readers with a chance to win. 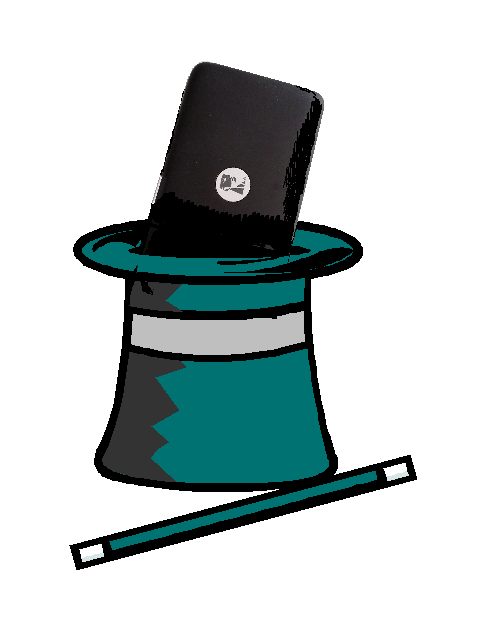 Kingston Technology's #MobileliteWirelessG2: It's Like Magic! 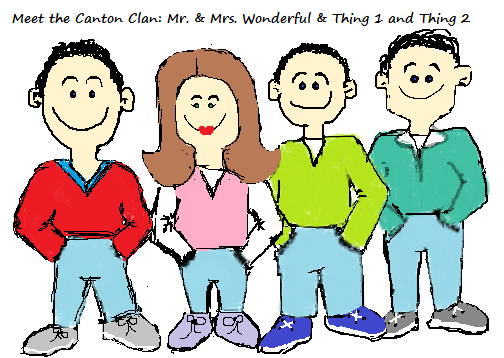 there was a very cool Mom and Dad and their sometimes evil, but generally not teen boys. 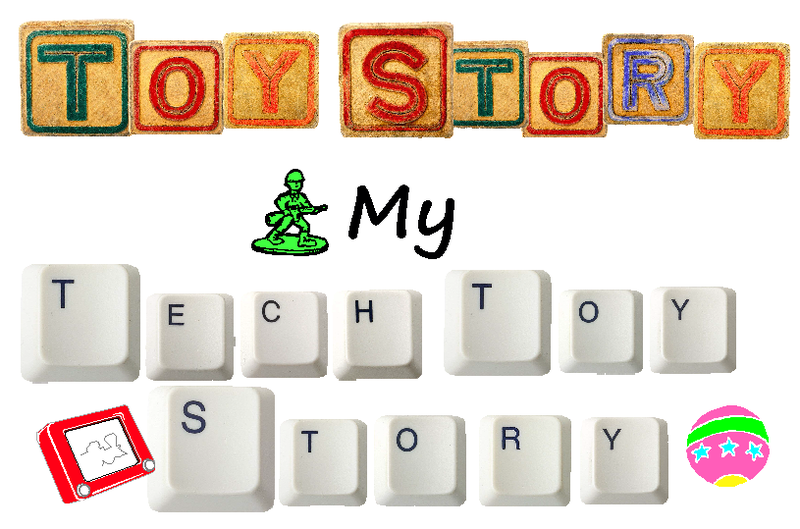 That family is mine, and this is our Tech Toy Story. It's safe to say my family has a bit of tech. Each of us have at least three Wi-Fi enabled devices, and demand for internet access is constant and persistent. 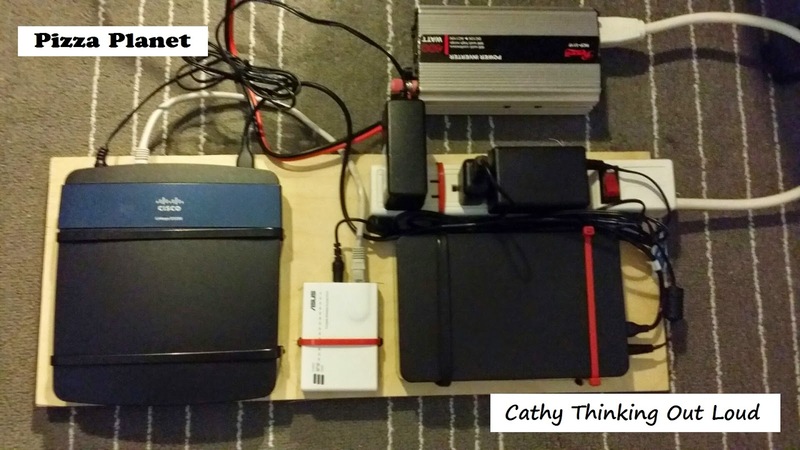 My husband (our designated IT Guy) may have grown a tad bit sick of constantly setting and debugging connections when travelling and on road trips. bundled together two Wi-Fi routers, a hard drive and a DC to AC converter. 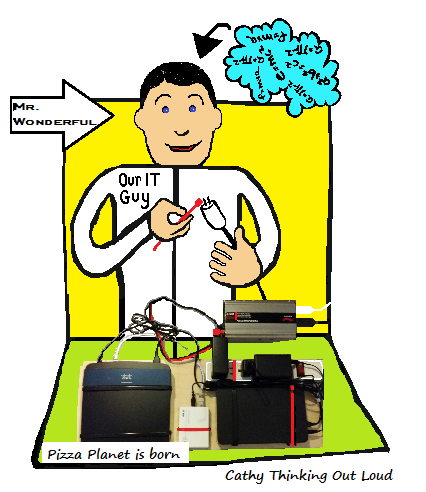 All the toys in toyland could now connect to the one router (affectionately referred to as Pizza Planet). When we stopped at a hotel or restaurant he would link the second router to the available free Wi-Fi. unless of course I turned off the car, resulting in Pizza Planet going radio silent causing Thing 1 and Thing 2 (aka EVIL Teens) to awaken and turn their boredom and bottled up energy on their delightful, ever-patient and long-suffering parents (aka Mr. and Mrs. Wonderful). Overall it all worked well (I'd expect nothing less from Mr. Wonderful), but it was bulky, and he did look at bit sketchy walking through hotel lobbies with his piece of plywood covered in electronics and wires. Once in the hotel room Mr. Wonderful would go to work hooking up Pizza Planet for all to use. or worse would have a single Ethernet port (whatever that is) hidden somewhere under a desk. Either way Pizza Planet to the rescue; a single connection to the internet provided by the hotel and all the devices were automatically connected. Mr. Wonderful you're our hero! Kingston Technology has somehow managed to stuff all the magic of Pizza Planet, and then some into a tiny device. so no fear of poking the hornet's nest (aka evil teens) like when turning off the car would disconnect Pizza Planet. Just for the record evil teens this is the definition of first world problems. The multi-tasking Mobilelite Wireless G2 allows you to charge your devices, connect them, share photos and data between them, and use the wireless router to talk to other devices connected to your Mobilelite. It's easy to use (even for the tech-challenged like myself); simply download the Mobilelite app from iTunes or Google Play, and connect the devices you want to access with the Mobilelite G2. 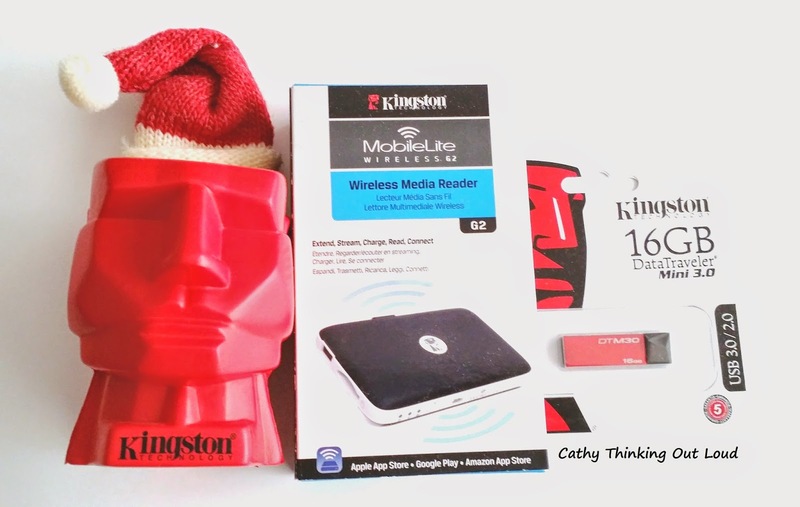 As we approach the holidays and start thinking of the perfect gift and the long road trip to visit family might I suggest you gift yourself the Kingston Tech Mobilelite Wireless G2, it's like magic. Do you travel during the holidays? What are your tips for staying connected and merry? Yep, just me Cathy thinking out loud about our TOY STORY. 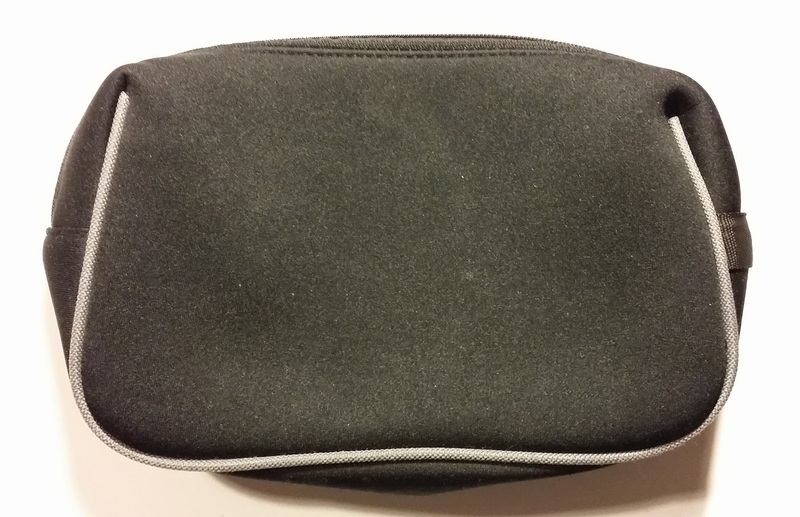 Note: I received a Kingston Technology Mobilelite Wireless G2 for the purpose of this post. All opinions are my own and reflect my personal experience with the brand and product. A day once a year (but why stop there) when you commit to giving back. A day to give of yourself, your time and maybe even your money. It's all about finding ways to connect with people, organizations and charities that desperately need your help to do good and help others. It's like a giant group hug! We all have the power to give and make a difference in some way. There are plenty of ways to give and lots of ideas that cost so little but mean so much . In fact many of these not so random acts of kindness can last all year long. Mucho Burrito is one such brand that gives back. They get involved, support causes, and actively recruit their Embajadores to do the same. They "put their money where there mouth is" so to speak. Although I admire their commitment to giving back, I only want to eat at Mucho Burrito if it tastes good. Well aren't we in luck! The food is fresh healthy and absolutely Mucho Delish! So in the spirit of #GivingTuesday Mucho Burrito has been kind enough to give me two $25 gift cards to giveaway. 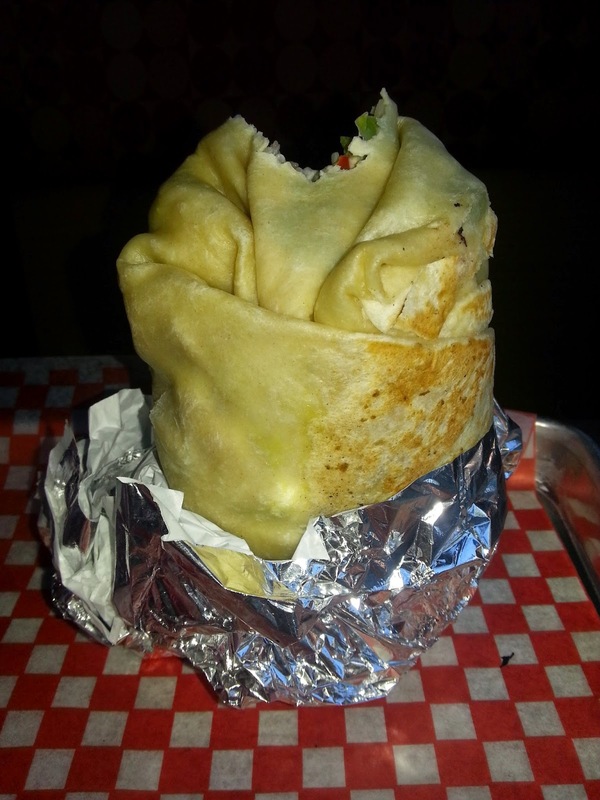 Two lucky readers will get to take a special someone for a Burrito and give the gift of YUM! Maybe you can share a burrito after a busy day of holiday shopping. While you're out shopping why not pick up an extra toy for a toy drive, or some non-perishables for a food drive. I myself get the regular size but the Mucho Macho men in my life go for the Mucho size burrito! Step Away From My Burrito!! just a delicious meal at your closest Mucho Burrito with someone special in your life. Be sure to follow Mucho Burrito on Facebook and Mucho Burrito on Twitter for all their news, contests and fun engagement! Yep, just me Cathy thinking out loud about Giving Tuesday. Note: I have been compensated for this post. I received Mucho Burrito Gift Cards so that I too can share a burrito with my family. It is one of our favourite places to stop for a quick bite that is delicious and healthy. We Mucho love it! #NationalSafeDrivingWeek - #ThumbsUpPhonesDown the right direction on the road to safe driving! I've been driving for many years, far more than I'm willing to admit, but lets just say I've turned 29 a number of times. I know we like to think that with age comes the wisdom and life experience that helps us make better choices, but I'm not sure that's always true. In particular I don't think it's true when it comes to safe driving. Unlike the youth of today, many of us "mature" drivers have not taken a driving course. More likely than not our parents, sibling, or friend taught us to drive, and since then we've had no additional training or refresher courses. 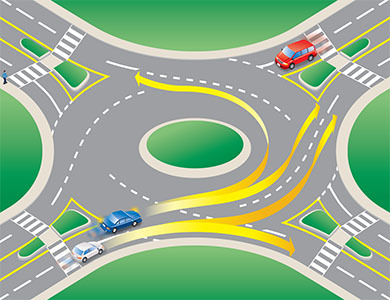 Meaning a great many of us do not know how a 4-way stop works and who has the right of way, or how to properly navigate a traffic circle. We think our years of driving somehow compensates for distracted driving, and not giving the road 100% of our attention. We think we are fine if we've only had a few drinks, or to to drive while taking medication that warns us not to drive while taking it. We think it's only the young kids that speed, or are distracted by others in the vehicle. I have two boys, both of whom are making their way through the courses and phases of getting their licence. My youngest is the one pointing out people speeding, not indicating, running a red, or not coming to a full stop at a stop sign. He is the one noting that the person beside us in talking, texting, or READING while they are driving. And guess what ... the majority of the time it is not teens and young drivers, it's us, the ones who have had our licences for ages and should know better and be modelling better behaviour to our kids and those young drivers around us. Maybe we just need a little help, or a refresher every now and then. 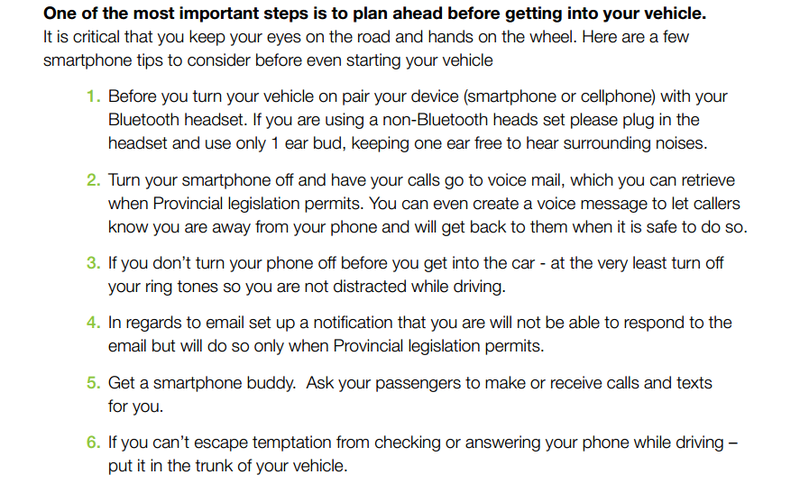 Given National Safe Driving Week started today I thought I would share a few tips of my own and links from TELUS and the Canada Safety Council to help get us headed in the right direction on our road to safe driving. Cathy's Safe Driving Tips ... as easy as 1,2,3. It came from the dollar store. What if you buy one and put your phone in this every time you get into your car and leave it there until you get out. What if you put this somewhere in your vehicle so you or anyone else that drives your vehicle can see it as a reminder to give their full attention to the road. 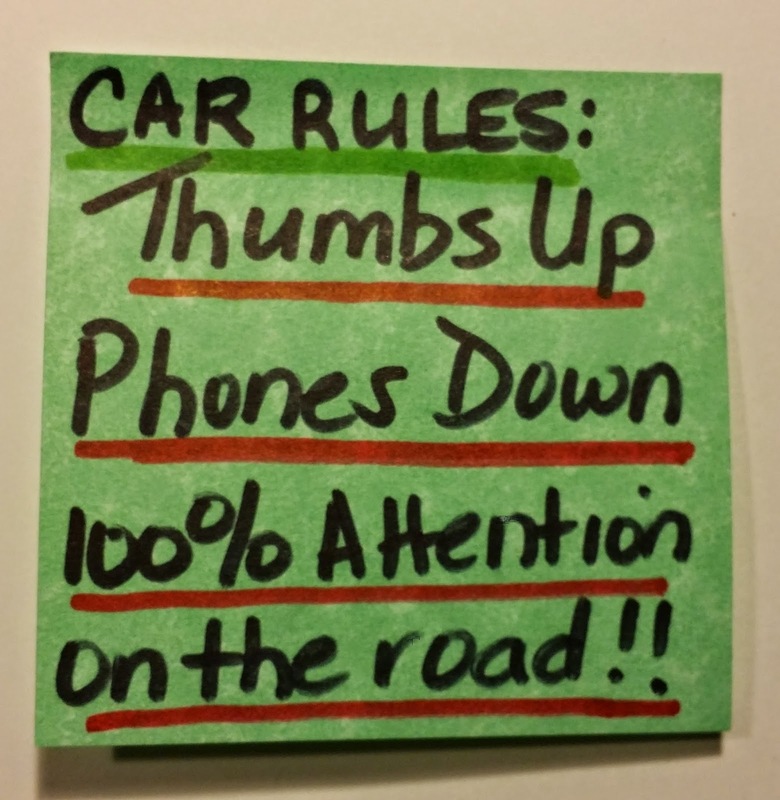 Take some time every year to review the rules of the road and then actually follow them! TELUS Surveyed Canadians on their distracted driving habits and this is what they found. Yep, just me Cathy thinking about Distracted Driving and how not to be. Note: I was not compensated for this post in any way. 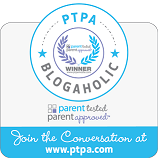 The purpose of this post is merely to share what I consider to be valuable information and resources with my readers.